Brochure Rack and Literature Holders keeps all your literature, pamphlets and brochures in an organized manner. Easy availability for your customers to see and retrieve. Trade Show fold-out Brochure Holders are the kind of trade show display that’s specially designed to travel with you. Literature Rack they’re the best display stand for trade shows and conventions, whether you’re using them as a magazine display rack, catalog stand or brochure display. Every one of them is designed to assemble quickly, keep your literature organized and fold down into a handy carrying case for easy travel. Browse the selection below to find the perfect Portable Display Stand for your next trade show event. Portable Brochure Displays put your sales literature right in the middle of the action. We offer wide range of Poster Sign Holder. 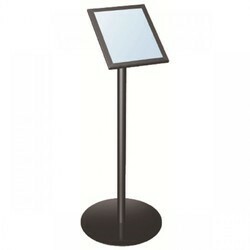 Looking for Literature Holders Stand Brochure Rack ?